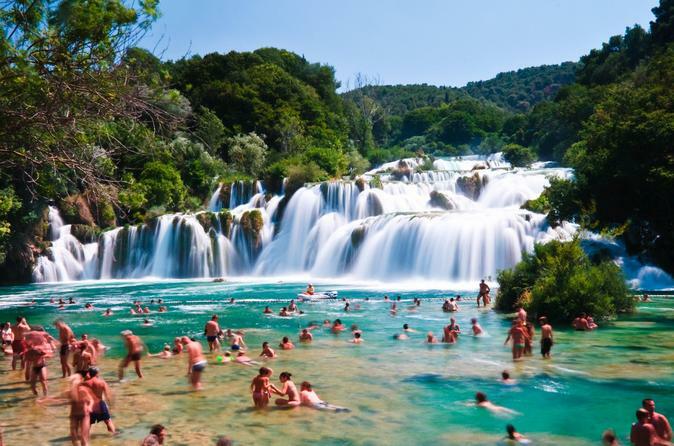 Board a coach for Krka National Park on this day trip from Split, and stop to soak under the splendor of its waterfalls. Take a boat ride through the park and spend several hours of free time frolicking in the water, or follow the footpaths to watermills, museums, restaurants, and more. Then stop in the pretty town of Sibenik to see the World Heritage–listed Cathedral of St. James. Boarding your coach in the morning, you'll depart from the Riva in Split. Relax during the 1.5-hour drive to the gateway to Krka National Park (entrance fee included) and listen to your guide's narration about one of Croatia's most stunning natural attractions. Set along the Krka River, the park features more than a dozen waterfalls amid steep canyons and gorges. On arrival, embark on a 30-minute boat tour through the park, followed by a guided walk. Around midday, set off on your own for more than 3 hours of free time. Relax on the beach, dip into the water, and swim close to the waterfall spray. Meander along footpaths around, under, and over the cascades, which drop and flow gently through woods and over rocks to a very large pool at the base. Some trails lead to gift shops, museums, and restaurants where you can purchase lunch (own expense). Be sure to bring your camera to capture the panorama views. In the afternoon, board the coach for the small town of Sibenik and take a 45-minute sightseeing tour including a visit to the Cathedral of St. James, inscribed by UNESCO on the World Heritage list. Following a short break, you will arrive back to Split in early evening.